Surf City Blitz takes over Huntington State Beach this weekend, bringing together one of the greatest punk rock lineups in the history of Southern California with Roland Sands Presents The Moto Beach Classic's world-class motorcycle racing. 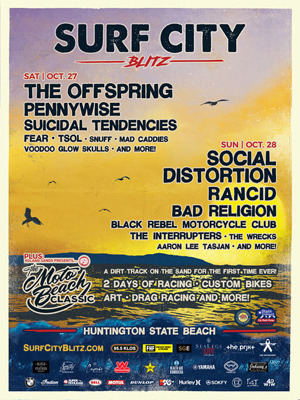 This brand new, all ages event takes place on Saturday, October 27 and Sunday, October 28 at Huntington State Beach as part of the SeaLegs Live Event Series, and will feature an all-star lineup of punk rock legends including THE OFFSPRING, SOCIAL DISTORTION, PENNYWISE, RANCID, SUICIDAL TENDENCIES, BAD RELIGION, and many more, performing on the shore of the Pacific Ocean in picturesque Orange County, California. Additionally, the second annual Moto Beach Classic combines Super Hooligan street bike flat track racing, drag and mini bike racing, art, custom motorcycles and, of course, the love of two wheels. The event will feature a dirt track on the sand for the first time ever and two days of Super Hooligan flat track racing.